A simple Qt application that shows your GPS information that is not normally available. 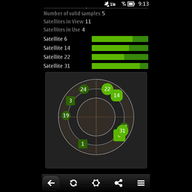 After a valid Signal is found, it shows your current position and average position, satellites in use and view. Along with showing signal strength there is an option to map your position via Nokia Maps. The Application runs in 5 minute slots, has dark and light theme and quits after 20 minutes of no activity to save battery.